I believe that interval training is very applicable to what we do on the fire ground. What are intervals? In their simplest form, they’re short bursts of high intensity exercise separated by periods of lower intensity effort. One of the unique components of all FRF workouts are, what I call, afterburners and/or interval overhauls. They are interval options performed at the end of the strength workouts. 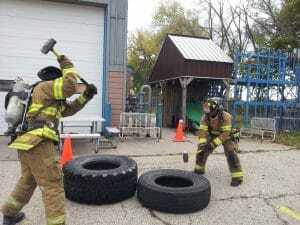 These interval overhaul or “afterburner” options are a combination of the fireground movement exercises that challenges your total body, allows you to work on firefighter skills, and can simulate the work intensity of the fire ground. And… they can really “jack-up” your metabolism too! You can do them in gear, in the firehouse, or in the gym, or even do them at home. You also don’t need a lot of equipment, the only required piece is a good interval timer (which you can get for free as an app on your phone or tablet). You can change the times based on the exercises you choose and your level of fitness. These intervals can more realistically simulate the exhaustion’s felt on the fire ground and rescue scene. Today, I finished workout #3 of the Ultimate Fire Rescue Athlete Program and created/ performed this 10 minute overhaul. ….three hours later I’m still sweating. Again, you can change the exercises and times. If you are new to these Interval Overhauls you may want to make them 30 seconds of work to 30 seconds of rest. Let me know if you like the idea and how you incorporated them into your own workouts.